This gadget helps you organize tasks in tabs, through a cool interface. 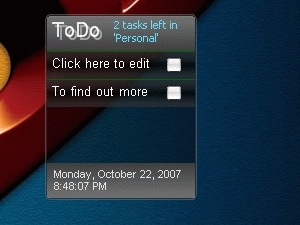 I wanted to download this, because I always have to do lists around, usually as a rainlender or as a firefox 3 add-on. Wasn't able to download though, could you tell me what software program it needs? It looks awesome!